The Unified European currency continues to strengthen gradually against the American dollar. On the four-hour chart the price is above the moving average with the period 50 confirming uptrend. Euro is also supported by fundamental data. The yield of 10-year Italian bonds has reached the level of 4.04% for the first time and disagreement in the party of Silvio Berluskoni shall strengthen the position of the government. However, investors’ sentiment can be clouded by the strike of the transport workers in Portugal, as they are firmly set against reduction in wages and the increase of the work hours and possible privatization of the public transport. It is unlikely that the workers can get more favourable terms as country’s budget will be approved at the end of November and government is not planning to make major amendments. ZEW business sentiment index in Germany and Eurozone will become known today. According to the forecast this index shall increase, which will support European currency. The nearest resistance level on the four-hour chart is the previous highs of price at the level of 1.3537. Support level will be one of the local lows at 1.3441. 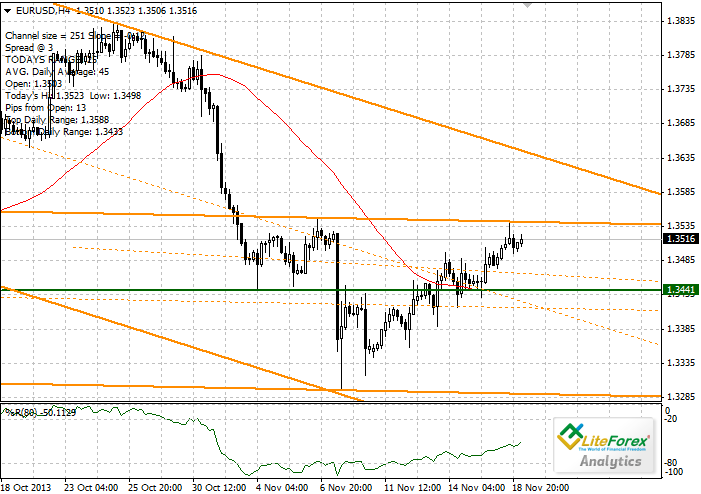 It is recommended to open long positions above the level of 1.3537 with the target of 1.3600 and stop-loss at 1.3512.